Photography is the fastest-growing medium in the fine-art world. Consider for a moment the thousands of cell phone photos we take every year. Before the digital age, millions of people took millions upon millions of photos to document life and preserve memories, all recorded in now-fading snapshots, Polaroids and darkroom prints. The thread from today’s digital snappers to the earliest daguerreotypes is the distinct desire to express ourselves creatively through these tools. Compared to the ancients like painting and sculpture, photography is a relatively new medium, one that was slow to enter the art world. The High Museum of Art began collecting photographs in the early 1970s with the help of philanthropist Lucinda Bunnen, at a time before most institutions considered photography a fine art. Today, photography makes up the largest portion of the High’s permanent collection (about 40 percent), with more than 7,000 images from around the world. The exhibition Look Again: 45 Years of Collecting Photography, running through April 14, returns to the early days of the medium in the 1840s, through American modernist and documentary traditions in the 20th century, to today’s sought-after blue-chip shooters. Look Again, part of a reinstallation of the permanent collection in a new gallery space, represents the museum’s commitment to showing photography and provides a great overview of many of the medium’s most interesting quirks. 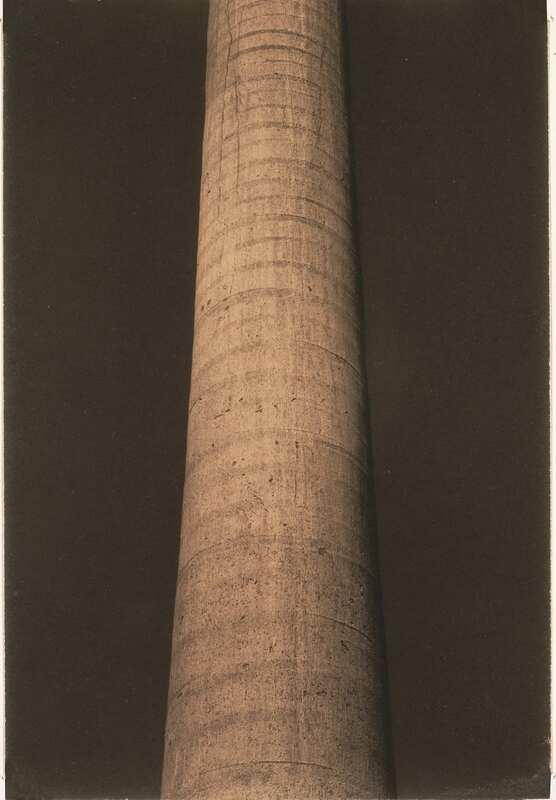 The first piece to join the permanent collection was seminal American photographer Edward Weston’s simple black-and-white image of a palm tree trunk. It’s a palladium print, named for a rare form of darkroom printing that gives the final image warm red-brown tones. Bunnen, who donated the print to the High, bought it for $200, a hefty price at the time (similar Weston prints today can sell for $500,000). The work is representative of a coveted group of American modernist photographers (Ansel Adams, Robert Frank, Dorothea Lange) who defined styles and techniques as photography moved from mechanical reproduction to artistic tool. The High is pleased with the breadth of its modernist collection, curator Gregory Harris says, and doesn’t plan to add work in the category. 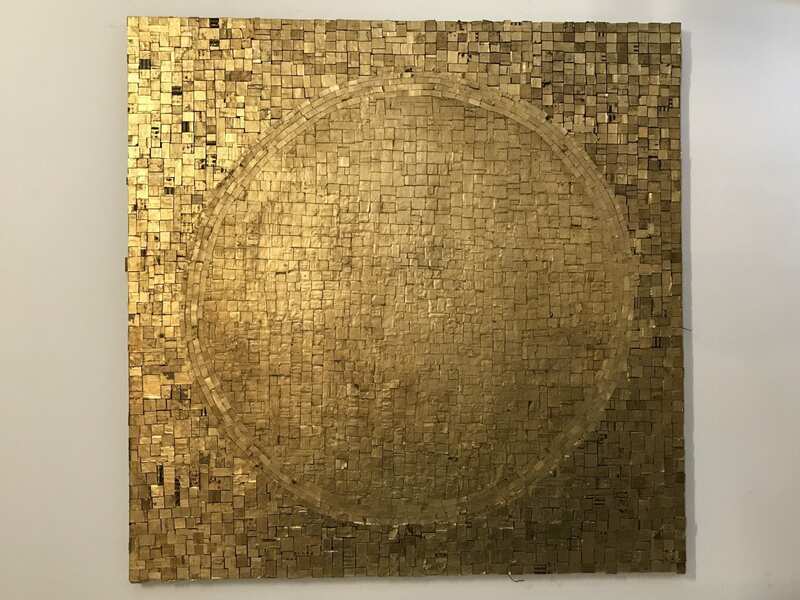 The pieces have become so expensive, he says, they’re now found on the yachts of Wall Street bankers. The High actively collects more contemporary work. 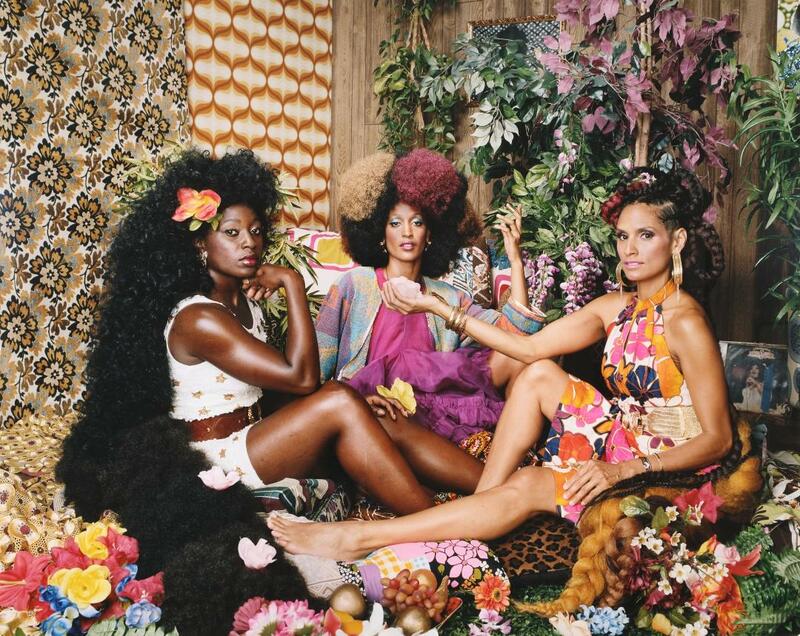 Its most recent addition is Les Trois Femmes Deux by Mickalene Thomas, who’s known for lush, large-scale color photographs that depict African American women in environments full of pattern and color. 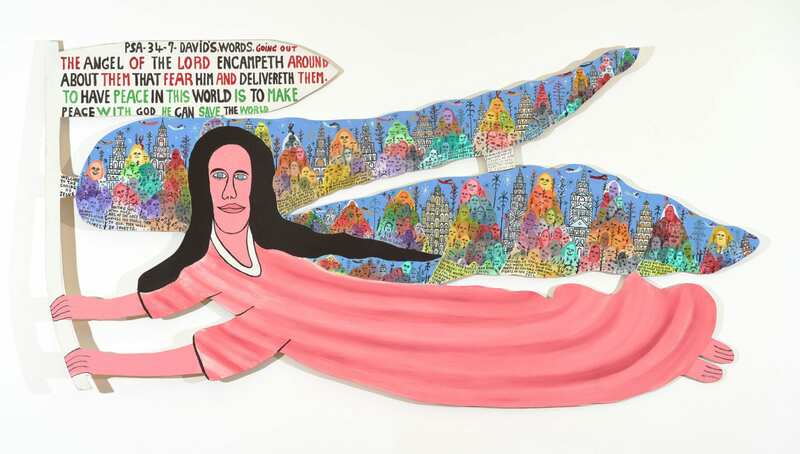 Much of her work features a retro wood-paneled basement, overlapping African textiles and 1970s kitsch elements. The models in Les Trois Femmes Deux are arranged to evoke Manet’s The Luncheon on the Grass. As with most of Thomas’ images, there’s much to look at — vintage record covers, cascading jewelry, over-the-top hairstyles that fill the frame, dozens of fake flowers and fabric swatches that fight for your attention. The work centers the women in a powerful, female-controlled way that is undeniably awesome. Look Again includes only a few key pieces by Southern photographers because curators are planning a more thorough exhibition of that work. To keep them from fading, photographs can only be shown for six months every five years. Inclusion in this show would preclude them from being seen in a future one. At any given time, the High has thousands of photographs in storage, and conserving them is challenging. 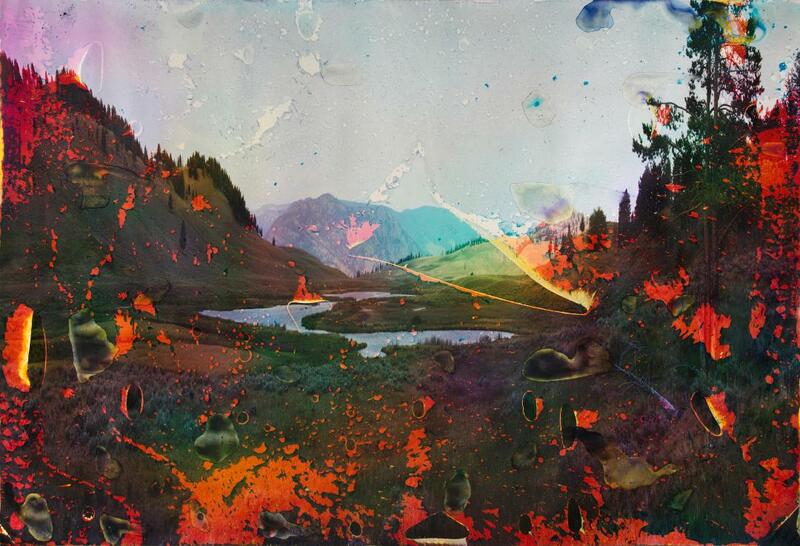 Blacktail Lake WY 7 by Los Angeles artist Matthew Brandt, for example, is a C-print (a color darkroom print). This means the large-scale final photo was soaked in water from the lake in its title. The resulting image is a faded, color-shifting landscape that evokes a surreal, stained dreamland. Although curators are charged with keeping it in the best condition for as long as possible, it will continue to change and fade over time as all photos do. Look Again is worth a look simply as an entry point to the High’s photography collection. As the museum continues to give more gallery space to photography, future viewers will be able to see much more of it. What sets Look Again apart is its broad overview of some of the most influential pieces in the permanent collection. Since they can only be displayed every five years, viewers might not see them again for a long time.